Put your favorite libation to new use with this all-natural beer shampoo and conditioner. This just in: Brewers, barkeeps, and boozers have found a new use for their favorite refreshment. Turns out, beer is great for hair. 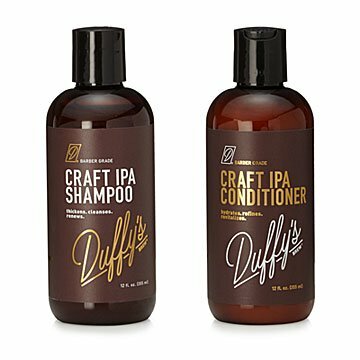 These IPA-inspired shampoo and conditioners (sold separately) are designed for voluminous, silky soft locks. It’s naturally rich in amino acids, hops, roasted barley, and malt with some added botanical extracts for an exceptional scent. Always sulfate, paragon, and phthalate-free, you’ll lather up for a great-smelling mane from root to tip. Made in California. Directions: After shampooing, massage through hair for 1 – 3 minutes. Rinse thoroughly. The joke was on me but he loved it! Ordered this for my beer loving son and forgot he is bald! He loves it anyway and uses it on his beard and bald head.